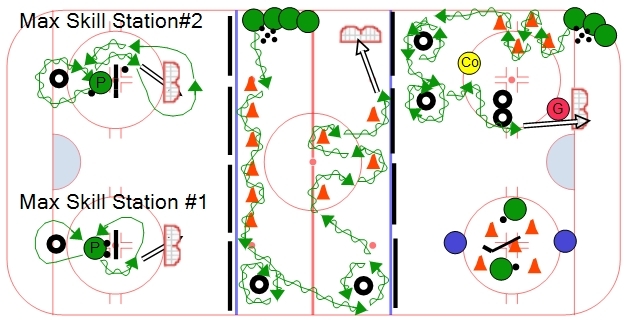 This stickhandling progression has three variations and can be set up in stations depending on the amount of players you have. In this demonstration there are four players at each circle. Each repetition should be about 20 seconds. So on the whistle the active players need to go outside the circle and the in-active players can come into the circle to do the drill. The first drill is simple. Each player carries a puck and they need to be creative as they can as they move through the objects. While we want them to be creative we want them to be in complete control and have awareness of the other player/players in the circle. The second drill has the first player leading the first player without a puck. This forces the second player to do several things. First they have to keep their head up in order to follow their partner. 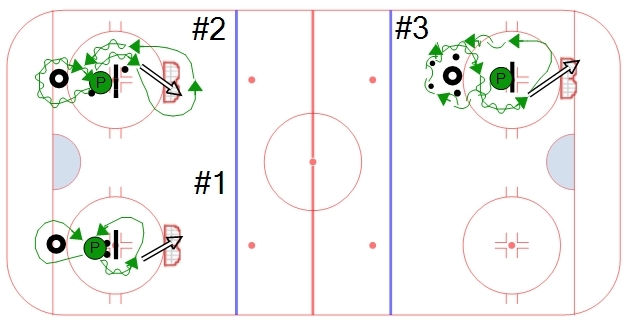 Second, they have to maintain control of the puck while trying to keep up with the player, and third it forces them to react to the changing of directions. The third drill starts the same way as the first drill but now the players need to make passes to the in-active players. They have to maintain awareness by keeping their head up and knowing which player on the outside is open and ready for a pass. 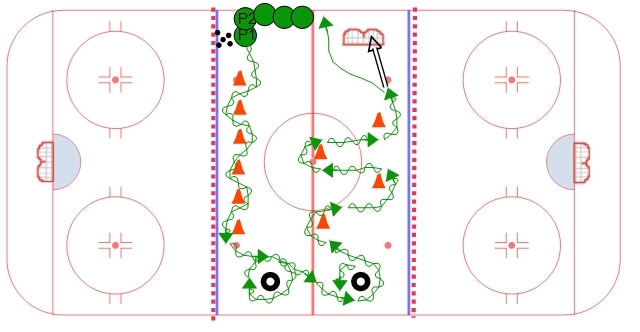 This station drill incorporates puck control, passing, receiving, control turns, and shooting. The first obstacles are a series of cones. The players should work on protecting the puck from the cone by using their body on both forehand and backhand sides. After the cones they give the coach a pass and get it right back. When they get to the tire they do a complete circle around the tire while controlling the puck and using their body to stay between the tire and puck. Then they skate to the next tire and do the same thing in the opposite direction. After the second tire they skate towards the net. At the two tires they do a single shift move around both tires and then take the shot. Players should alternate which direction they do the shift on each repetition. So first, fake to the forehand and go to the backhand. On the second repetition they should fake to the backhand and go the forehand. This station hockey drill is setup for young players to work on stickhandling and puck control. In the first set of cones the players simply weave in and out of the cones. Players should use their forehands and backhands to control the puck through the cones. 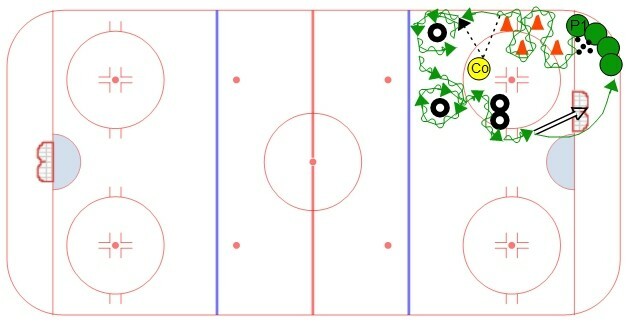 At the end of the first set of cones they do a control turn around each tire while controlling the puck. In the last set of cones they do more control turns around each cone. An important area of emphasis is to encourage players to keep their eyes up. Have coaches stand at both ends watching players' eyes and reminding them to keep their eyes up. It is especially important at these young ages. If they are allowed to develop and grow while playing with their head down it is such a tough habit to break when they are older. 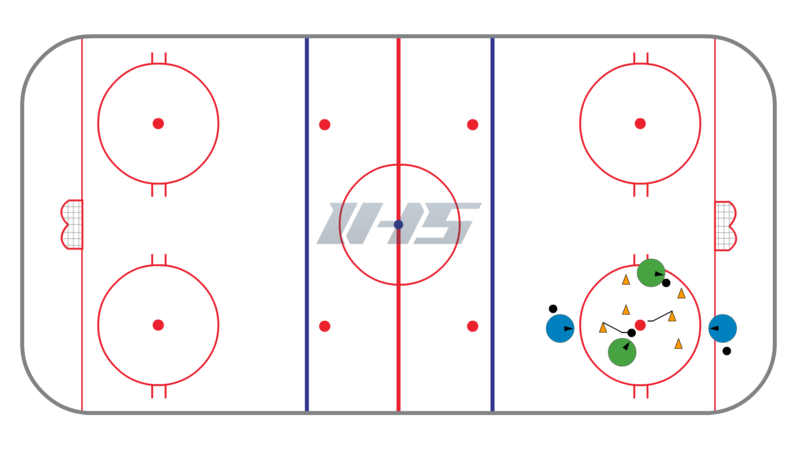 On the first set of cones more advanced players can try to move the puck to one side of the cone while their body goes to the opposite side. A great setup for stations or even private and small group lessons. This setup requires a small area of the ice, a tire or cone, a small barrier (not the long ones), and a smaller sized net (if available). As you start working within this setup you will most likely start to think of the limitless possibilities of drills you can do from this formation. There are a lot of basic fundamentals that player get to work on in these drills. TIP: You can make a game out of it by timing players and having penalties for missing the net.